Here is my entry for the CLICK - CITRUS food photography event hosted by Jai and Bee of Jugalbandhi. The original post with the recipe and this photo is here. Srivalli of 'Cooking for all seasons' is organizing a fund raiser to help Lakshmi who is now suffering from a heart disease. More details click here. Since Lakshmi's family could not afford the cost of the operation, our friend Srivalli has started a campaign to raise enough money to cover the costs and give a life to that twenty eight years old Lakshmi who is a mother of two and who is fighting for her life. Let's join Srivalli in supporting for this noble cause. There is a tamil saying "Siru thuli peru vellam" literal meaning "Little drops make a flood", so let this fund raiser be. You can support this campaign by donating to the fundraiser, and/or by publicizing this campaign. Let us all pray that Lakshmi should soon recover from this heart disease. Click the chip in button for donation. 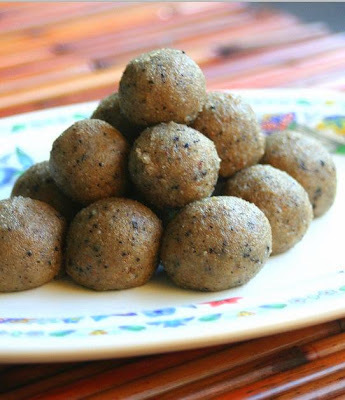 An eye catching, tasty and a healthy dish for rice or roti that can be made using very few ingredients. 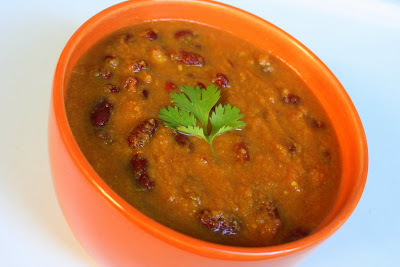 One such dish is Rajma curry. Rajma is otherwise called red beans or kidney beans. 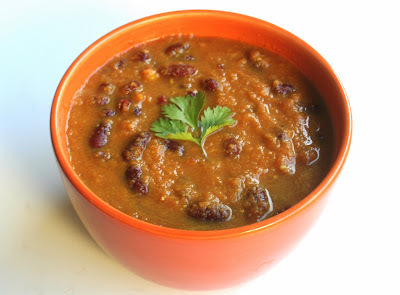 Here is one simple and delicious curry using rajma. This curry is based on Mallika badrinath's Rajma curry in her Vegetarian Gravies cook book. Soak rajma in water overnight or atleast 10 hrs. Drain the water and pressure cook rajma with one cup water for 2 to 3 whistles. Keep rajma separately. Preserve the water. Blanch the tomatoes: Boil water and add the tomatoes. After a few minutes the skin will peel off. Drain water and cool it. Remove the skin completely. Finely cut the tomatoes and keep it aside. Heat oil in a kadai and fry the ground masala paste. When oil separates from the masala add finely cut tomatoes. Cook with half cup water in reduced heat. Add the cooked rajma and add enough water (use preserved water) and cook for five minutes. Turn off heat and garnish with finely cut coriander leaves and serve with rotis/chapathis. 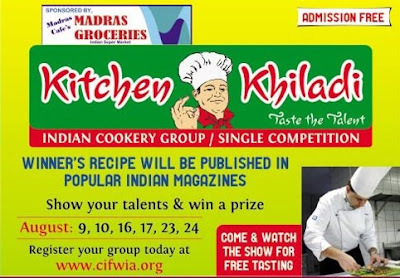 This is my entry to Curry mela hosted by Srivalli of Cooking for all seasons. Grilling the fruits caramelizes the natural sugars in them. Grilled fruits and vegetables are a healthy choice that seduces the tastebuds. I had very ripe mangoes and I grilled them in my electric grill to make chutney using very few ingredients. My electric grill has non stick surface. Here is how I prepared. Peel the skin of the mangeos. Slice and discard the seed. Heat the grill until the surface is very hot. Spray oil on the surface. Place the mango slices on grill. Cook for apporximately 5 minutes on each side or until nicely browned with grill marks. Remove mango from grill. Chop them finely and transfer it to a bowl. Add the ginger, chillies, salt and lemon juice if required. 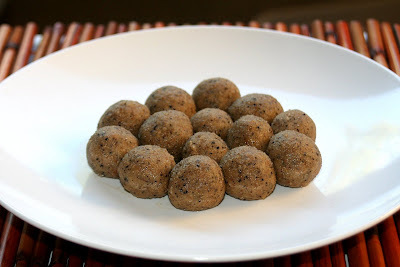 Stir and use as a spread for bread or use as a side for chapathi. I did not use lemon juice since the fruit was already a little sour. You may choose to grill firm ripe mangoes since it will retain its shape and it is less messy. If using the firm ripe mangoes, chop the grilled mangoes into small cubes, add other ingredients along with finely chopped red onions to make a tropical salsa. This is my entry to Monthly Mingle - Grill It! Beans and carrot palya is a very simple and delicious vegetable side for any south Indian rice variety. I have simply seasoned the microwave cooked vegetable with salt, mustard seeds and urud dal. Here is the recipe. Wash the carrot and beans together. Drain water and transfer it to a microwave container. I used the Microwave rice cooker. Microwave on high for 8 minutes partially opened. Heat oil in a kadai and add the mustard seeds. When it pops, add the urud dal. When the urud dal turns golden, Reduce heat and add the cooked beans and carrot. Stir. Add the turmeric powder, asafoetida powder and salt. Stir until even distribution. Turn off the heat and garnish with desiccated coconut. 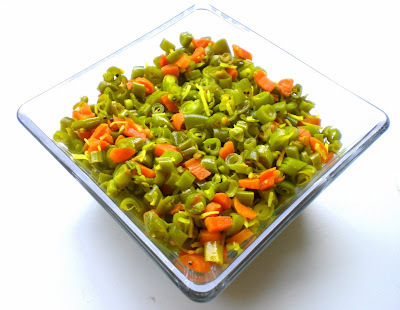 Enjoy this vegetable with rasam rice, sambar rice, curd rice or how ever you want. I sometimes wrap in with chapathi or just fill a bowl full of this palya and enjoy it as such. 2. Independence Day theme hosted by Pooja of Creative Pooja. Thank you Srivalli and Pooja for hosting the event. Pasta is one simple and delicious wholesome meal. Preparing a simple pasta dish is very simple. 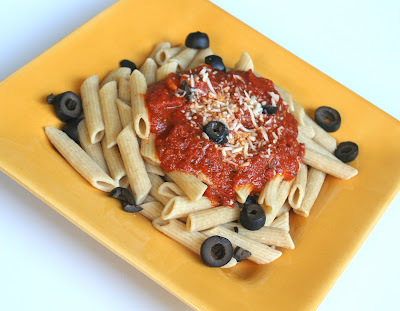 If you have few basic ingredients, a delicious wholesome pasta meal can be prepared with homemade marinara sauce. 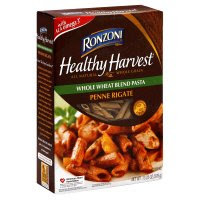 I have used whole wheat penne pasta and that makes the dish more healthy. Here is the recipe. Boil 2 quarts water with 2 teaspoons salt and add half box pasta. Stir occasionally. Cook until pasta is tender. When pasta is cooked, drain water using a colander. Keep is aside. Heat olive oil in a saucepan and add the crushed garlic, ground pepper and tomato. Allow the content to boil in medium heat. Stir occasionally. When it is boiling, add the Italian seasoning, the pesto sauce, half cup water and quarter teaspoon salt. Keep it partially closed and let it cook until the oil separates. Turn off heat. Take a scoop of cooked penne pasta in a plate. Add the prepared sauce on top. Top it with olives and grated parmesan cheese. This pasta is my entry to the following events. Food in colors - Red - event hosted by Sunshinemom of Tongueticklers. A.W.E.D - Italian event hosted by Dhivya of Culinary baazar. Herb mania - Basil event hosted by Ammalu of Ammalu's kitchen. La Cucina Italiana event hosted by Meeta of What's for lunch honey. Thank you for hosting the wonderful events. Looking forward for the roundups. For some reason, this website is not opening in the Internet explorer. I get a dialog box reading "Internet explorer cannot open the internet site ..... Operation aborted". I don't know the reason for this. Sorry for the inconvenience. I am happy that this website works fine in firefox browser. Thanks to my blogger buddy for bringing this to my notice. Hope to solve this problem soon.